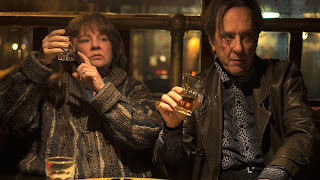 A biographical drama, Can You Ever Forgive Me? 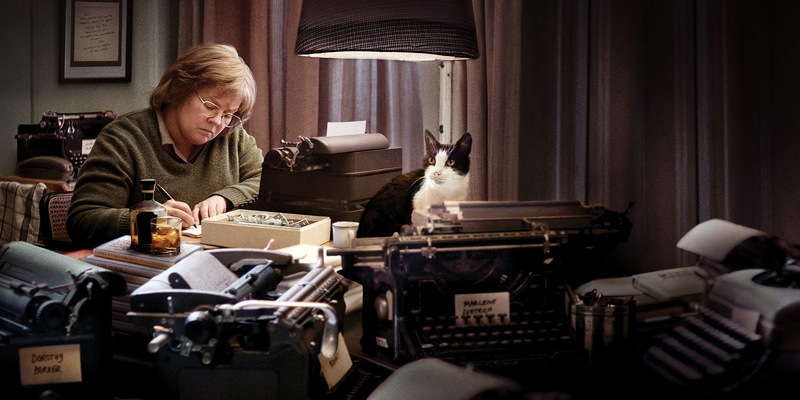 offers a slight story enlivened by a strong Melissa McCarthy performance. It's 1991 in New York City, and Lee Israel (McCarthy) is a once-famous author specializing in biographies. Her books no longer sell, her latest project, a biography of Fanny Brice, generates no interest, and her agent has stopped returning her calls. It does not help that Lee is anti-social, grumpy, filthy and a hard drinker. 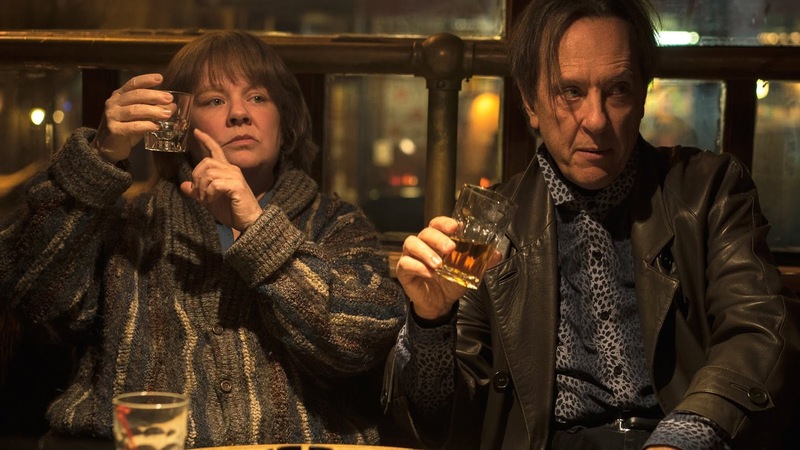 Other than her elderly cat, her one friend and drinking buddy is Jack Hock (Richard E. Grant), an even less famous pretend author who is now practically homeless but maintains a joie de vivre. Facing severe writer's block, and unable to pay the rent or look after her sick cat, Lee resorts to selling her memorabilia, then stumbles across an original Noël Coward letter stuffed in a library book. 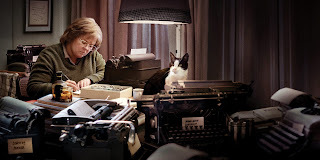 Discovering an active collectors' market for original letters by famous people, she invests in old typewriters and starts forging letters, selling them for cash to various bookstores and traders. Meanwhile, bookstore owner Anna (Dolly Wells) attempts to start a friendship with Lee, who finds it difficult to welcome anyone into her life. Directed by Marielle Heller and based on Israel's book, Can You Ever Forgive Me? is a small story about a desperate woman tapping into an unregulated market feeding collectors' hunger for celebrity memorabilia. Israel's crimes are mundane, and so the film is not so much about her misdeeds as a character study of a distinctly unlikeable person. And Melissa McCarthy's comprehensive shift to drama is an impressive success. The only reason to care about Israel is through the performance, and McCarthy finds the sad and lonely soul turned bitter against a literary world that has moved on and dumped her by the wayside. The Nicole Holofcener script could have benefitted from a bigger investment in the events leading to Lee's career downfall, but McCarthy does the most with the material on offer. The subplot featuring the friendship between Israel and Hock carries echoes of Midnight Cowboy's companionship through squalor. The openly gay Hock is both a cohort and a polar opposite, maintaining a smile, a positive attitude and a glint in the eye despite rapidly dimming life prospects. The film highlights delicious irony in Lee finding a creative outlet and taking pride in her forgeries. Recognizing she never had the talent or willingness to write in her own voice, she puts on the cloak of deception and mimics the flourish of celebrities. The few hundred dollars paid for each counterfeit letter serve as recognition of her talent, at least as far as she is concerned. At around 10 minutes under two hours the film stretches its meager material, and the pacing is distinctly slow. But thanks to McCarthy, Can You Ever Forgive Me? earns clemency.